Have you ever wondered when cosmetic packaging began to be utilized? Cosmetic containers, cosmetic boxes, and cosmetic vessels are all found in historical records as artifacts and reliefs in some cultures. These items are referenced in historical or archaeological literature in specific styles, shapes, and motifs. Pyxis, a “cosmetic vessel” in Ancient Greece, was referenced as early as fourth century B.C. In Ancient Egypt, artifacts inscribed kohl tubes, “kohl” (ancient eye cosmetic) vessels and kohl spoons were created in stylized shapes relevant to Egyptian ideology and represented in specific hieroglyphics. 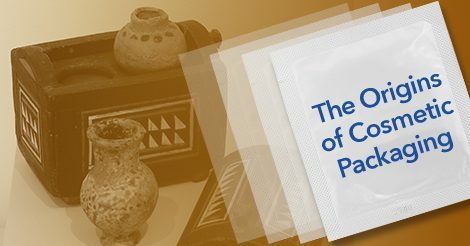 Toiletry items first made an appearance in Ancient Egypt. Ancient History Encyclopedia records indicate that from the Paleolithic to the Neolithic Age, spanning from 6000-3150 BC, ivory combs and kohl spoons were among the first of these items produced. Common themes for shapes became the ankh symbol, ducks, and lotus flowers. Also during that time, small bowls were mechanically drilled and used as a type of unguent jar, or a toiletry kohl cosmetic vessel in everyday life and to be included as grave goods. The desert sun and Nile floodwaters during inundation produced a need for facial-eye protection. This “eye paint” or eyeliner was used when working in the flooded lands. Unlike today’s social norms, scholars theorize that this eyeliner was also used by males. The creation of eye paint cosmetic palettes in Predynastic Egypt may have been the start of the lineage of the kohl cosmetic artifacts. The famed Narmer Palette, dating from about the 31st century BC, is believed by scholars to have been created to commemorate the unification of upper and lower Egypt as cosmetics for the king. We have come a long way since Ancient Egypt’s first jar of eye paint. At Liquipak, we have over 50 years of experience packaging cosmetic products. As an ISO: 9001 registered facility, we can ensure that packaging specifications are met without sacrificing design used to market your product. If you have questions, please contact us for more information about Liquipak’s packaging for cosmetic manufacturers.